In the summer of 1966, John Densmore, Robbie Krieger, Ray Manzarek and Jim Morrison entered Sunset Sound Recorders in Hollywood to record their first album as the Doors. The Doors’ stated intention at one point was to be “as big as Love,” so they welcomed the opportunity to record for the same label. The equipment at Sunset sound was standard for the time but seems thoroughly archaic today: a four-track tape machine, onto which went the rhythm section on one track, guitar and keyboards on a second, and Morrison’s voice on a third. The fourth was to be used for overdubs. And that was that. The sessions lasted only a week, wrapping up on Aug. 31, two days after the Beatles played their final public concert up the Pacific in San Francisco. 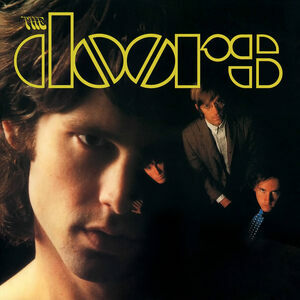 The Doors then went back to concentrating on live performances, waiting for the album’s release. That came on Jan. 4, one of the first albums to hit the shelves in 1967, which turned out to be a watershed year in music history, with much of the material that constitutes the backbone of Classic Rock arriving to enthusiastic audiences. “The Doors” certainly helped set the stage. With “Light My Fire” topping the singles charts and the LP reaching No. 2, Morrison and company went from being local Los Angeles heroes to among the best-known bands in the United States and beyond, a status that, of course, continues to this day. Although some of the album’s tracks are heavily rooted in the blues, stylistically “The Doors” bears little resemblance to most of the rock music being released at the time. The featured instrument, for example, was Manzarek’s Vox Continental keyboard, which he often played in a lively manner that evoked carnival music. His intro to “Light My Fire” is a prime example and helped define the band’s sound as it became a radio staple during the summer of ’67. Because the band lacked a bass player, Manzarek took care of the low notes, too, gaining him much acclaim among fans for his versatility and virtuosity. Actually, the first single to be released from “The Doors” was the opening track, “Break On Through (To the Other Side),” which peaked at No. 126. It also was subject to the first instance of censorship involving the doors: Morrison’s original line “she get high” was altered to exclude the last word. For the album’s first cover version, the band performs a spirited, somewhat campy rendition of “Alabama Song (Whisky Bar),” was originally was published in Bertolt Brecht’s “Hauspostille” in 1927 and set to music the same year by Kurt Weill in Weimar Germany. A musical cross between a foxtrot and blues, the song appears in the opera “Rise and Fall of the City of Mahagonny” as a discourse between prostitues. The song that opened the door for the Doors began life as a relatively straightforward composition by Krieger. The distinctive intro was added by Manzarek, and his keyboard solo and Krieger’s guitar solo helped stretch the finished version of “Light My Fire” to nearly seven minutes. The edition that appeared on 45 was around three minutes, keeping all of Morrison’s vocals intact. The song continued to be a staple of the Doors’ live sets through the end of 1970, often clocking in at upwards of 20 minutes. If “Light My Fire” presents Morrison’s voice at its most radio-friendly, Willie Dixon’s “Back Door Man” amply demonstrates his lascivious side, his whoops and yells leading in to his boasts about visiting married women: “Hey, all you people that tryin’ to sleep/I’m out to make it with my midnight creep.” Of course, the sexual innuendo has been misinterpreted over the years; then again, with everything we’ve come to know about Jim Morrison, who’s to say what he was thinking? “The Doors” starts to wind down with three decent enough tracks: “I Looked at You,” the ethereal “End of the Night” and the hard-rocking “Take It as It Comes,” featuring a particularly dextrous Manzarek solo and Morrison’s exhortation to “specialize in having fun.” The song concludes abruptly with him shouting, “moving much too fast,” which serves as an appropriate counterpoint to what follows. Radio listeners who bought “The Doors” expecting a bunch of “Light My Fire”-like ditties must have been taken aback by the album’s final track. Simple and eloquent, the opening verses soon give way to the musings of Jim Morrison, Poet, who takes the listener on a mystic journey that culminates in a stunningly graphic Oedipal scenario, even though the version on record is whitewashed, with Morrison screaming instead of uttering the two key words that follow “Mother I want to …” He wasn’t shy about completing the thought in performance, though, getting the Doors banned from the Sunset Strip’s Whisky a Go Go after owner Elmer Valentine (1923-2008) took offense. The Doors released five more studio albums before Morrison’s death on July 3, 1971. But although they all have their moments, particularly the finale “L.A. Woman,” the band never could match the creativity and impact of its debut.